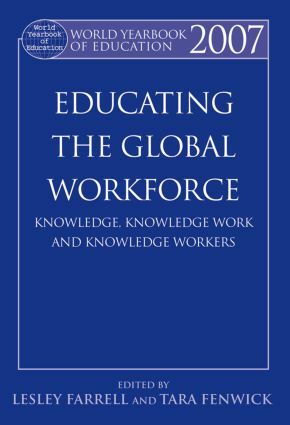 The 2007 edition of this respected international volume considers the challenges facing work related education arising from the rapid expansion of the global economy and the impact of this on labour markets and individual workers. the pressures on formal education and training institutions to produce graduates with certain kinds of knowledge, skills and personal attributes. Lesley Farrell is an Associate Professor at Monash University, Clayton, Australia. She has an international reputation in the field of language and global work, and has published widely. Her research and publications have focused on language and social change in globally distributed workplaces, paying particular attention to the development of new forms of ICT-enabled workplace literacy, the effects of globalization on local work practices and local knowledge-building, and the role of local work-related education in the production of the global knowledge economy. Tara Fenwick is an Associate Professor at the University of Alberta, Edmonton, Canada. She has an international reputation in the field of work-related learning and has published widely in the field. Her research and publications have focused on three related areas within the field of work-based learning and education: (1) learning in work, including organizational learning, gender in work and learning, and socio-cultural understandings of learning in work; (2) professionals’ lifelong learning, focusing on experiential learning, problem-based learning, portfolio careers and knowledge networks in fast-changing, flexibilized work environments; and (3) teacher development, focusing on teacher professional growth plans, and teacher development in international contexts.